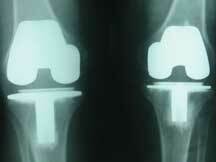 A site dedicated to information about alternatives to knee replacement surgery. Knee replacement surgery replaces the knee joint with an artificial joint made out of metal and/or plastic. In patients with severe degeneration of the joint and chronic pain, this surgery can relieve most or all of the pain and improve function. However, some of these patients with knee pain can benefit from nonsurgical treatments or less invasive surgical procedures that can delay or eliminate the need for a knee replacement. This website offers information about many of these alternative treatments (See Nonsurgical treatment and Surgical Treatment). - Knee replacements can wear out. Patients who put heavy use on this replacement joint are likely to have it wear out more quickly than patients who are more sedentary. Younger patients may outlive the lifespan of their replacment. - Knee replacement surgery is major surgery and occasionally has severe complications. - Many patients who have had their knee replaced still have residual pain and may have limitations to their mobility. - Revision surgery that is needed if a replacement joint wears out is more complicated and has a higher complications rate than primary replacement surgery. Revisions also do not last as long as original replacements. Alternatives to knee replacement do exist. These alternatives can help the knee heal itself, resulting in less pain and more mobility, without the need for major surgery. For more information on problems that occur with knee replacements, go here.